H.263 is a standard video-conferencing codec. As such, it is optimized for low data rates and relatively low motion. ITU H.263, H.263L, H.26L, H.263E, ISO/IEC 14496 These video codecs are the Basis for MPEG4 Simple Profile. 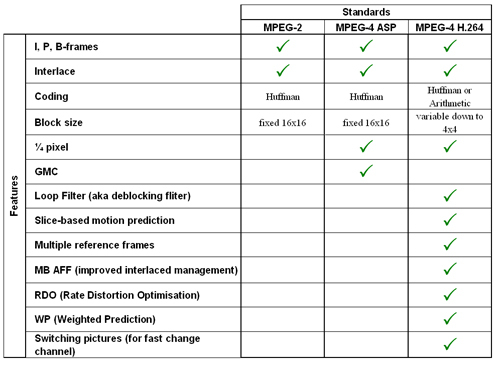 MPEG-4 adds advanced error detection and correction services on top of H.263. 3GPP and ISMA are versions of H.263 and MPEG-4 for streaming and mobile applications. These are really a variation of Transport stream. Also called JVT ITU H.264 ITU-T Rec. H.264 MPEG-4 Part 10 ISO 14496-10 AVC Advanced Video Coding AVC ...whatever you call it, this is revolutionary. H.264 is being widely recognized as the future platform of video compression for applications such as new HDTV services, portable game console, mobile broadcast video services, video on solid-state camcorders, instant video messaging on cell phone. H.264 is the most advanced video coding standard available today. It uses many new coding techniques not available in MPEG2, MPEG4 and H.263. This chart shows the evolution of video coding standards. The new H.264 video compression standard is the first to be ratified by both the ISO/IEC and ITU-T. It raises the bar considerably compared to MPEG4-ASP and yields better picture quality while significantly lowering the bit rate. This allows lower overall system cost, reduced infrastructure requirements and enables many new video applications. H.264 is considered the greatest achievement in video compression in the past 10 years and is already finding its way into many mainstream video applications. ITU-T SG15 H.263 came out in February 1995. Designed for low bit-rate communications, it never really worked well over pots (plain old telephone service) lines. It has replaced H.261 for video conferencing in most applications and also dominates Internet video streaming today. The coding algorithm of H.263 is similar to that used by H.261, however with some improvements and changes to improve performance and error recovery. The differences between the H.261 and H.263 coding algorithms are listed below. Half pixel precision is used for motion compensation whereas H.261 used full pixel precision and a loop filter. Some parts of the hierarchical structure of the data-stream are now optional, so the codec can be configured for a lower data-rate or better error recovery. There are now four optional negotiable options included to improve performance: Unrestricted Motion Vectors, Syntax-based arithmetic coding, Advance prediction, and forward and backward frame prediction similar to MPEG called P-B frames. H.263 supports five resolutions. In addition to QCIF and CIF that were supported by H.261 there is SQCIF, 4CIF, and 16CIF. SQCIF is approximately half the resolution of QCIF. 4CIF and 16CIF are 4 and 16 times the resolution of CIF respectively. With the support of 4CIF and 16CIF the codec has surpassed other higher bit-rate video coding standards such as the MPEG 1 and 2 standards and a variant is now officially adopted as MPEG 4. Work on MPEG-4 started at the MPEG meeting in Seoul Korea November 1993 with completion that was scheduled for 1998. MPEG4 adds a layer of error resilience. This is achieved through resynchronizations, byte alignment, data partitioning the reversible variable length code (RVLC), adaptive intra refresh (AIR), and error detection and concealment. 1. Resyncrhonization: Under the MPEG-4 spec, a resynchronization marker can reduce the error propagation caused by the nature of variable length code (VLC) into single frame. In MPEG-4, the resynchronization marker is inserted at the top of a new group of blocks GOB with the header information (multiplexed block number [MBN], quantization parameters) and optional HEC, so that decoding can be done independently. It is a good idea to place the resynchronization marker prior to important objects like people to improve error resilience with minimum increase of overhead. 2. Byte alignment: Bit-stuffing for the byte alignment gives additional error detection capability through its violation check. 3. Data partitioning: A new synchronization code named motion marker separates the motion vector (MV) and discrete cosine transform (DCT) field to prevent from inter-field error propagation, thus allowing effective error concealment to be performed. When errors are detected solely in the DCT field, that multiplexed block (MB) will be reconstructed using correct MV. This results in natural motion better than simple MB replacement of the previous frame. 4. RVLC: The RVLC enables forward and backward decoding without significant impact on coding efficiency. This feature localizes error propagation ideally into single MB. 5. AIR: Different from the conventional cyclic intra refresh, AIR employs motion-weighted intra refresh, which results in better perceptual quality with quick recovery in corrupted objects. 6. Error detection and concealment: Errors can be detected through exception or violation in the decoding process, and then concealment will be applied. The functionality is included for mobile application. The endpoint of H.324 can support for MPEG-4 audio, so that MPEG-4 audio could be used for H.324 mobile phone terminal.